Spring is here, summer is just around the bend, and right now you likely fall into one of two training categories: 1) you’re right on track, to run, bike, climb, swim, and conquer whatever herculean goal you made for 2019; or 2) you’re on the couch watching your goals and race-entry fees slip away due to persistent, debilitating injuries. If you’re among the latter, put away the ibuprofen and potato chips, and get ready for action—help is on the way. I’m all too familiar with nagging injuries. Running and marching with a 65-pound rucksack in crappy army boots hardly prepared me for a successful running career as a civilian. Low-back, knee, and hip pain plagued me off and on into my mid-30s, to the point where I never thought I would run anything longer than a 5k. Thankfully, I was introduced to the “reformer,” a Pilates apparatus. I liked it immediately because it offered a completely different approach than other forms of rehab and exercise. The difference was I could move through varying degrees of motion that I couldn’t do against gravity due to my low back and knee pain. On a reformer, I could sit, lie, stand, kneel or recline; slowly increasing resistance to movement as I progressed. Before I knew it, I ran my first marathon, qualified and ran Boston, and, a year later, ran my first 50-miler. Since then I’ve finished every endurance race, I’ve entered, including the Ridge Run last year (my first time, at age 46)—and all of it pain- and injury-free. I’d been reformed, restored, and reborn! So, from a physical-therapy perspective, why is this form of rehab better than other options? First off, you can move through ranges of motion safely, limiting the stress placed on specific joints and muscles. Secondly, a reformer conditions the entire body, even the ankles and feet—no muscle group is over-trained or under-trained. Finally, short muscles, acquired through more conventional weight-bearing workouts, yield tightness and minimal flexibility. The reformer improves muscle elasticity, joint mobility, and core strength, allowing for a balanced body that is more resistant to injury. 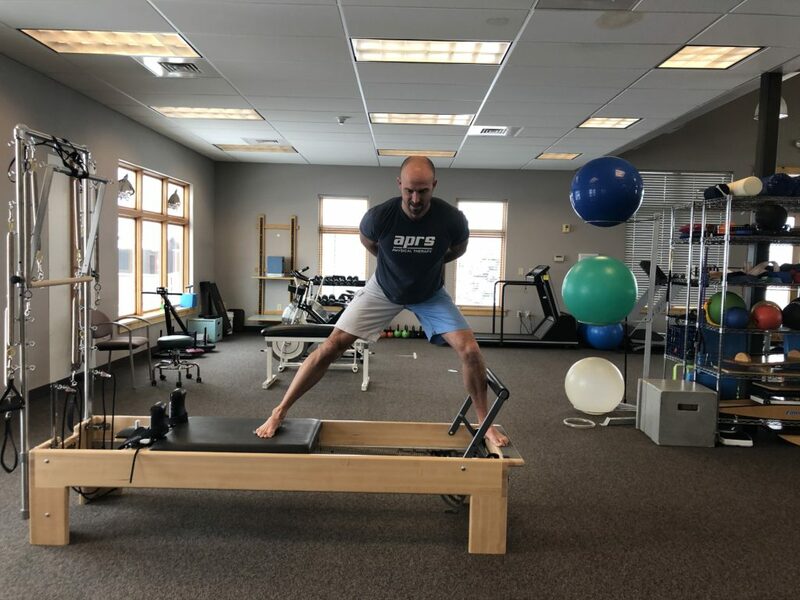 So, before you change your summer goal from running the Rut to watching every Ozark episode, give the reformer a try. You’ll be in good company—many elite athletes now use this apparatus as a critical part of their training regimen. Ali Ramirez, DPT is a physical therapist and certified apparatus Pilates instructor at our APRS East Clinic.